You won't find the 300 MPG Volkswagen XL1 in an American showroom, in fact it has even been denied a tour of America because it is too efficient for the American public to be made widely aware of, and oil profits are too high in America with the status quo in place. No tour has been allowed for this car because the myth that 50 mpg is virtually impossible to obtain from even a stripped down econobox is too profitable to let go of, and when it comes to corporate oil profits, ignorance is bliss. Years ago I had calculated that it should be possible to get a small car to exceed 100 mpg by putting parallel direct to cylinder water injectors side by side with the fuel injectors, and using the exhaust manifold to preheat the water so it would enter the cylinders as dry steam, thus providing added expansion (which drives the engine) while allowing the combustion process to proceed without reducing it's efficiency. But I was obviously wrong with my calculations, because they were in fact over 2x conservative. The 100 mpg carburetor was indeed a reality, and the Volkswagen XL1 proves it with only straightforward nothing special technology we have had since the 1970′s. Though the XL1 can be plugged in to deliver a 40 mile all electric drive, it does not need to be plugged in EVER to achieve 300 mpg. And it does not cheat in any way to achieve the rating, it weighs over 1,700 pounds, has normal tires, and delivers a very good driving experience with a governed top speed of 99 mph. The XL1 could reach a top speed in excess of 110 mph absent governor and turns in a 0-60 time of 11.5 seconds which is by no means leisurly for a car designed for efficiency. The XL1 in no way cheats on performance to hit it's rating. It is simply the car we should have always had, and have had taken from us in the name of oil profits. Though the XL1 can hit 300 mpg under ideal driving conditions, it's combined mileage is usually a little over 200 mpg, and if you do city driving only that will drop to a minimum of 180 mpg under the worst driving conditions. But I'd be happy with that no doubt. If the XL1 was equipped with an 18 gallon fuel tank, and you did all highway driving, you could fill it up with an oil change and when the next change was due you could change the oil and keep driving without filling up for and additional 2,400 miles. But it comes with a much smaller fuel tank, because if it could go that long on a single tank chances are the fuel would foul before it got used. The tank is only 2.6 gallons to prevent fuel age related problems from happening. So fill ups are cheap. Many of the publications which speak about the XL1 did so when it was a concept car predicted to get right around 250 MPG. But in 2014, after extensive testing of cars now produced, test drivers report economy above 300 mpg under the correct driving conditions, which would be close to sea level, a flat straight road with no stops, and reasonable speeds. To get rid of miles/imperial/U.S. gallon confusion, in the metric system the XL1 is rated to deliver 100 kilometers per litre. Translated for the U.S., that means approximately 65 miles per quart. I remember how I laughed at the Smart Fortwo, because even a full size 4 door Chevy Impala significantly beat the “Smart's” fuel economy, and with the Impala you would get a whole car. 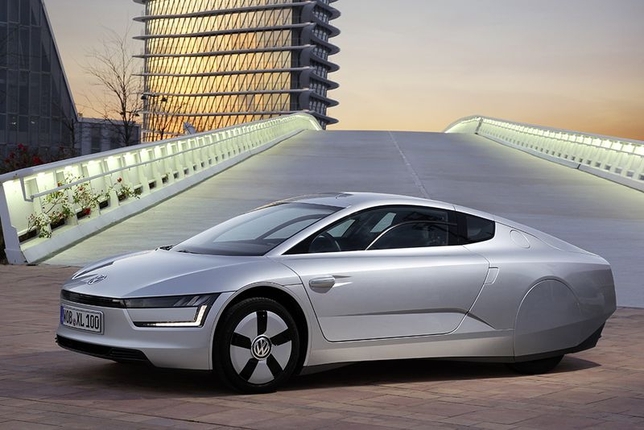 The Volkswagen XL1 is clearly the two seater the Smart should have been if it really was what the name implies, and the XL1 is in contrast, a car I'd be proud to be seen in. 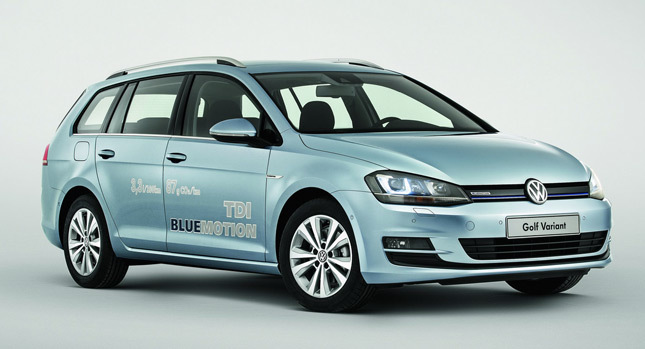 You will NOT see the Xl1 in America, even it's far less efficient 85 mpg non hyrid full size station wagon counterpart – the Jetta TDI blue motion wagon (Img: Carscoops.com), which is made in America is banned from American roads. And I would like to ask why? What excuse is there for banning highly efficient cars from American roads? One excuse is that “they don't meet American crash test standards”, but the real truth is that the Fed simply refused to ever crash test them because of what they are, in Europe even the XL1 is considered to be a very safe car in crashes, and the Jetta station wagon is obviously even safer and you CAN buy the non TDI versions of the exact same car in America. The only thing different is the engine, WHAT GIVES? The answer is obvious. Simply for the sake of raking in huge profits from $4 a gallon gas, getting guzzled at 10X the rate it should be, the corporations have via campaign contributions and other types of pay outs succeeded in getting the FED to legislate the best cars off the road for irrelevant trumped up reasons. 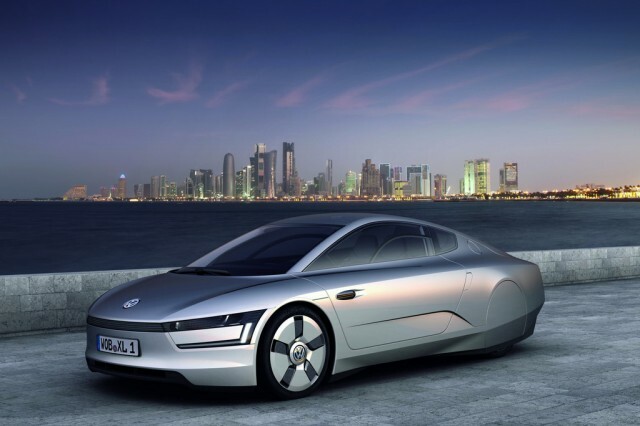 The XL1 will not meet American emission standards NOT because it is not clean enough, it will not meet them simply because inefficient parts that are mandated by the EPA are not part of the XL1′s power train. The Xl1 is SO MUCH the car that the oil companies do not want that there will only be 2,000 made. And no production line was set up for them, they are all hand made. And irrelevant “lightweight” parts are added to the frame, consisting of carbon fiber and other exotic materials to add to the mystique. But the materials and production limits are a load of BUNK, the car STILL weighs over 1,700 pounds, if it weighed just 100 pounds more everything exotic could be removed, because “exotic materials” are not doing much anyway, they are just marketing. Cost is not the issue either Even after being hand made with “exotic” materials in an intentionally limited edition, the Xl1 still only costs $60,000. There is a lot more of a market for this car than 2,000 units at that price, have no doubt, this car is being held back on purpose. If it can be hand made for that little, automated assembly lines could do it for half. And if a 1,700 plus pound Xl1 can get 300 mpg, a 3,400 pound Chevy Truck should be able to deliver at least 150 MPG, the Xl1 lays the mileage scam bare, with every hybrid that gets 40 mpg and every truck off the line that gets 20, Americans are getting the shaft and they do not even realize it.